Aug. 4, 2017 - Sensors in the sawmill industry have come leaps and bounds over the last several years, and there are seemingly endless new players in the manufacturing game. When Tolko Armstrong lumber mill in British Columbia chose ifm’s 3D sensors to replace the photoeyes on its unscrambler as part of a larger upgrade to the mill in 2014, Dwayne Bueckert, a control systems specialist with Tolko Armstrong lumber mill, was a bit sceptical. Bueckert oversaw the installation of two ifm O3D300 sensors for its two-stage Mill Tech unscrambler in January 2015. Since the installation there has been almost zero maintenance required on the sensors, and Bueckert says he is more than pleased with their performance. “If I had 20 of these sensors right now I would install them all and I know exactly where,” he says. Tolko’s eight and nine-foot Armstrong lumber mill produces a variety of products from a diet of spruce, pine, fir, larch and hemlock. The mill, an hour drive north of Kelowna, employs about 120 people. The sawmill’s unscrambler previously used photoeyes – photoelectric sensors that detect the presence or absence of an object – placed at various angles to view the upper and lower pockets and determine the amount within, but if boards were at odd angles they would block the vision of the photoeyes, which would then miscalculate what was in the pocket. “It was a maintenance nightmare,” Bueckert says. “Your photoeyes are right there at the end of the pocket, sooner or later a stick slips through the slot.” As well when the mill changed runs and there was a new pocket amount needed, the photoeyes had to be physically moved to adjust for the new amounts, a job that required electricians. The ifm 3D sensors, by comparison, are programed to measure volume of the pocket in litres, and are installed on roof brackets 16 feet above the pockets. Installation was a simple matter of mounting the sensors on the brackets. The sensors can be easily programed for new volumes as needed. “The effectiveness went through the roof, the maintenance through the floor,” Bueckert says. One mishap occurred early on after the install when a loose board from the upper pocket came off and hit the lower-pocket sensor, which was at the time mounted too close to the upper pocket. That sensor has since been moved further away and the angle adjusted with no incident. The 3D sensors continuously measure uneven surfaces and adapt to the shape of bins to determine minimum, maximum or mean values. Built with stainless steel, the sensor determines the level via a defined background and transmits the process value digitally, immune to noise, via an Ethernet process interface. Tolko’s operators are able to customize the target depth of the pockets according to the run selected. “The sensors made the whole automation process very easy for us and eliminated the need for us to even talk about it – this is probably the most I’ve talked about it since we put them in,” Bueckert says. What the sensors lack in speed, they make up for in ability to work in low light environments. “Now we’re looking back at some of the other installs where the application isn’t very fast, and saying to ourselves, ‘Can we put this one in now and eliminate these lighting issues,’” Bueckert says. The Armstrong mill plans to install several more of the 3D sensors in various lower-speed, low-light applications if the accuracy meets the mill’s needs, such as lumber flow and height detection for packaging. The sensors are also being used at other Tolko mills for various applications. 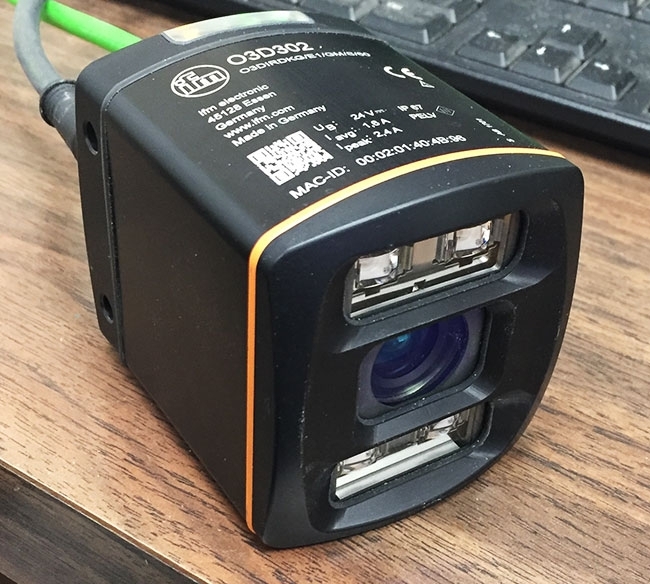 Since Tolko Armstrong installed the two O3D300 sensors, the manufacturer has released a newer version that has more resolution and more software capabilities, which Bueckert says will be his next purchase and installation. The sensors are purchased directly from ifm and shipped within days. The German-based company has branches in Vancouver and Montreal and a head office in Toronto.